Chris Duggan hit the goal trail in the black and gold after returning to the side following a lengthy injury lay off. The dust has barely had time to settle on East Fife’s 2016/17 League One campaign but already there has been sweeping changes at the club. Bayview manager Barry Smith has been swift to make offers to those he wants to retain on the playing staff while others have now moved on. Despite being offered new contracts by East Fife, midfielders Scott Robinson and Ross Brown have decided to depart Methil. Both will be playing Championship football next season after being snapped up by League One winners Livingston. Robinson, brought to the club by previous boss Gary Naysmith, has spent one season at Bayview and impressed as an attacking midfielder. For Brown, it brings to and end a long association with the club he came through the youth ranks at. The midfielder Tweeted: “Many thanks to everyone at @EastFifeFC during my time there! 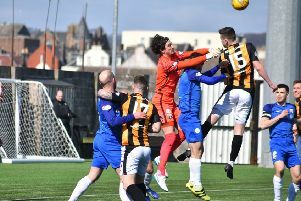 This week East Fife also confirmed the release of other players while the club’s loanees have returned to their parent sides. A spokesman for the Fifers said: “The club would like to express its appreciation to the following players who have been released or signed for other clubs for their efforts during the season: Mark Hurst, Alex Cooper, Ross Brown, Jordan Austin, Scott Robinson, Nicki Paterson, Kieran Duffie, Jesse Curran, Jason Kerr, James Penrice and Luke Watt. And it wasn’t just playing staff departing Methil. Assistant manager Kevin McGoldrick has also decided against returning next season. McGoldrick, brought to the club when manager Smith arrived, said: “After some consideration I have decided to quit as assistant manager of East Fife. But one name the Bayview support are hoping does agree a new deal is striker Chris Duggan. Duggan, who missed a large chunk of the last campaign through injury, has been offered a new contract by boss Smith. The former Queen’s Park striker, though, is still weighing up his options despite admitting he feels at home at the Fife club. He said: “The second half of the season has been great after I got back to playing following the injury. “We’ve done really well and we’ve a great bunch of lads in the dressing room at Bayview that I really have enjoyed being involved with. Amongst those already signed up for Bayview next season are Kevin Smith, Chris Kane and Pat Slattery. Goldmine Lotto - Last week’s winning numbers were 5, 18, 22, 23. There were no jackpot winners or runners up. The new jackpot is £1150 to be drawn in The West Port Tavern, Cupar on Wednesday, May 17. The East Fife Supporters Club will host its AGM on Thursday, May 25 at 7pm. It’ll be held at Bayview.